In the first decade of the twelfth century, probably in 1107, although this date is disputed, a son was born to Vitali Dandolo, brother of Pietro, Bono, and Enrico. The boy was named Enrico, like his uncle. This was the future Doge Enrico Dandolo, the purported mastermind behind the sack of Constantinople in 1204. At the time the entire clan, including Vitale and his four sons and grandchildren were living in the family compounds clustered around the parish church of San Luca. Given that Enrico Dandolo would eventually become a doge, would play a leading role in the Fourth Crusade and the overthrow of the Byzantine Empire, would eventually become the most famous of the Dandolos, and, with the possible exception of Marco Polo, the best-known Venetian of the Middle Ages, it is surprising that almost nothing is known about his life prior to 1172, when he was sixty-five years old. In June of 1164 his signature turns up on a loan agreement but other than that his name is entirely absent from the historical record until 1172. We do know he was married to a woman named Contessa and had children, one of whom, Ranieri, would serve as vice-doge while his father was accompanying the Fourth Crusade. A second wife named Felicita, daughter of Pietro Bembo, a procurator of San Marco in 1143, is mentioned, but only in a dubious genealogy which most modern historians have discounted. Lacking any real evidence about Enrico’s life prior to 1172, the assumption has been made that he spent the early decades of his life engaged in commercial ventures overseas, perhaps in Constantinople and Alexandria, and thus is absent from the historical record in Venice. Trade, however, produces a prodigious paper trail, and no documentary evidence of Enrico’s early commercial activities—if there were any—has survived. Enrico’s absent from the historical record prior to 1172 may be attributed to the fact that his formidable father Vital did not die until 1174, when Enrico was sixty-seven years old. According the Venetian law a father could emancipate his children by giving them their share of the patrimonial inheritance before he died. This severed the legal relationship between father and son, leaving the son free to act entirely on his own, as a separate legal entity as it were. Vitale Dandolo emancipated none of his sons, meaning that they lived very much in his shadow until he died. It is only after the death of his father that Enrico Dandolo’s own life comes more clearly into focus. Yet while Enrico spent the first six decades of his life in obscurity his family continued to play a leading role in the business and civic life of Venice. His uncle Enrico also became ensnared in a religious dispute which spilled over into the political realm and almost led to the permanent downfall of the entire Dandolo family. In 1134 Doge Pietro Polani nominated Uncle Enrico as Patriarch of Grado, the highest ecclesiastic office in the Veneto region. Formerly located in Aquileia, the Patriarchate was moved by the Patriarch Paulinus to the island of Grado, located just off the coastline, six miles to the south of Aquileia and fifty miles east of the Venetian Lagoon, after the Lombards invaded the mainland in 568. The Grado patriarchate had under its control six dioceses, including Torcello, Venice’s own diocese of Castello, and others. Uncle Enrico was only in his thirties at the time, young for such a prestigious church position, and he was not even an ordained priest before named Patriarch of Grado. Apparently he had spend the previous decade working as a lawyer. His main qualification may have been that he was a member of the influential Dandolo family. The Polani and Dandolo families were neighbors in the parish of San Luca and Uncle Enrico and Pietro Polani had known each other since childhood. Doge Polani no doubt assumed that Uncle Enrico would do his bidding as Patriarch of Grado. This was especially important since one of Doge Polani’s kinsman, Giovanni Polani, was the Bishop of Castello, the most important church position in Venice, although technically subordinate to the Patriarch of Grado. Doge Polani may have assumed that his childhood friend would do nothing to impinge on the power of his kinsman Giovanni Polani. 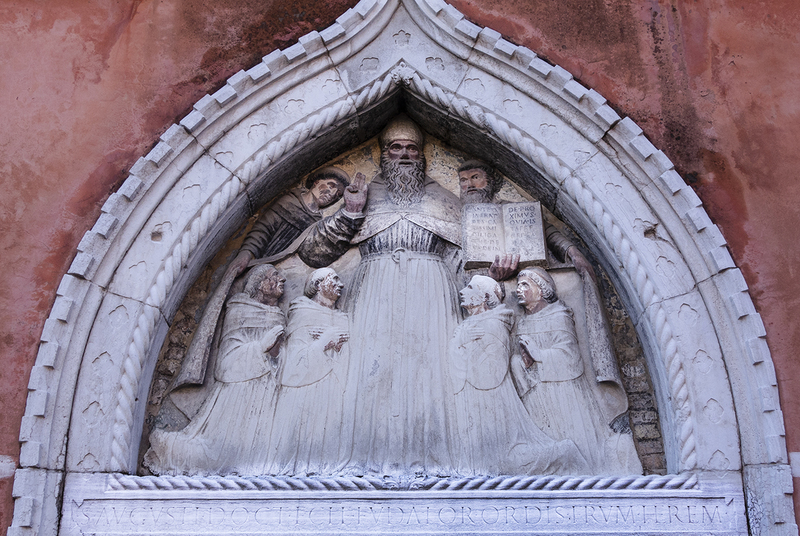 Uncle Enrico launched his advocacy of St. Bernard’s ideals by establishing the first Cistercian monastery in the Venetian Lagoon soon after his return to Venice from the Council of Pisa. 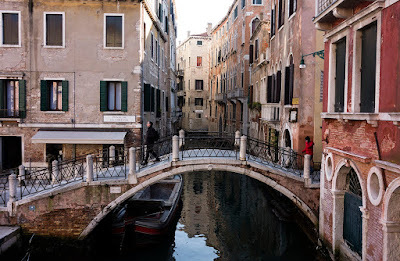 He also set about reforming the clergy in Venice, in particular the clergy of the Church of San Salvatore, in the heart of Venice, not far from the Dandolo family compounds. His goal was to create canons regular, associations of clergy who agreed to live under the Rule of St. Augustine, established around 400 a.d. by Augustine of Hippo (354–430). This, Uncle Dandolo believed, would allow them to lead lives less concerned with worldliness and more devoted to the traditional Christian virtues of humility, chastity, poverty, fasting, care of the sick and needy, and others advocated by St. Augustine. In 1139 the clergy of San Salvatore, with Uncle Enrico’s blessing, announced that they were embracing the Rule of St. Augustine, a radical departure from their previous, less-demanding practices. The Church of San Salvatore, however, fell under the jurisdiction of the Bishop of Castello, Giovanni Polani, the kinsman of Doge Polani. The Bishop had not been consulted about the reforms and he felt that Uncle Enrico had gone behind his back and abrogated his authority within the Castello bishopric. He thereupon placed the Church of San Salvatore under interdict, which meant that members of the congregation could not participate in various Catholic rites, including presumably baptism, communion, and confession. After attempts at reconciling the dispute locally failed, Uncle Enrico took the dispute to Rome where he appealed directly to Pope Innocent II. The Pope was an advocate of the Augustinian rule favored by Uncle Dandolo and the clergy of San Salvatore and decided in their favor. 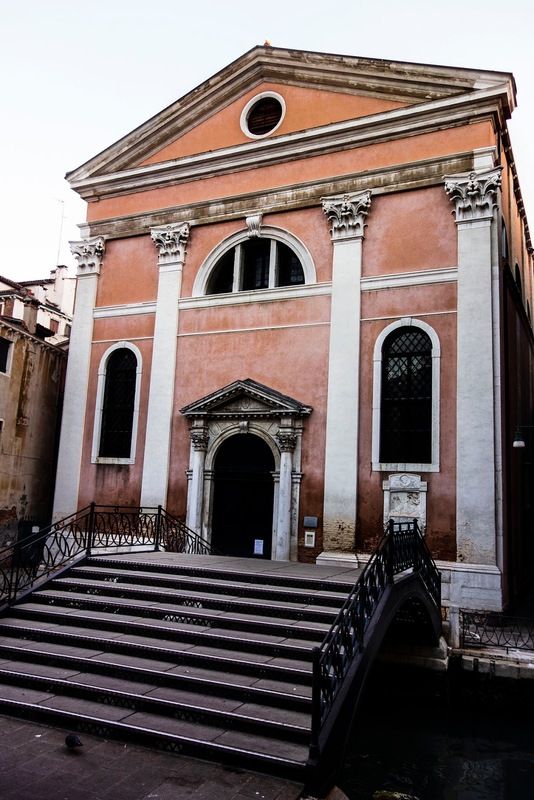 Not only was the interdict of the Bishop of Castello annulled, the Pope also put the Church of San Salvatore under his personal protection and sent two clergyman to Venice teach the new Augustinian rule. Bishop Giovanni Polani had suffered a humiliating defeat the hands of Uncle Enrico. It not perfectly clear how his kinsman the Doge Polani thought about these developments but it might be assumed he was not happy. It was he who had put Uncle Enrico in a position of power in the first place. The San Salvatore Affair was the wedge that opened the divide between the Dandolo and Polani families. A number of smaller controversies added fuel to what soon became a full-blown feud. Matters came to a head with the death of Nella Michiel, the abbess of the convent of San Zaccaria. Doge Polani, as was the custom at the time, nominated a successor, apparently one of his kinswomen. This in itself was not unusual. By tradition abbesses of San Zaccaria came from the family of the doge. The nuns of San Zaccaria voted on Doge Polani’s nominee and elected her as the new abbess. At this point Uncle Enrico interjected himself into the affair. Perhaps San Zaccaria was of special interest to him, since the Dandolo family, as we have seen, had contributed the relics of Tarasius to the church back in the early eleventh century. In any case, he pronounced that the Doge, as a lay official, had no right to nominate an abbess for San Zaccaria and that the nuns could only vote on someone they themselves had nominated. Doge Polani’s stance in the San Salvatore Affair was ambiguous, but now he was utterly infuriated. San Zaccaria was the wealthiest and most influential convent in Venice, and nominating a new abbess had traditionally been one of the perks of the doge. Uncle Enrico, Doge Polani felt, had clearly overstepped the bounds of his authority. Once again Uncle Enrico took a dispute between himself and Polani family to a higher authority. In January of 1146 he met with two cardinals in the city of Verona and presented his case. The ruling of the cardinals was not clear, but it remains a fact that the office of abbess remained vacant until September 26, 1151, when a named named Giseldrude was named as the new abbess. She was not a Polani or a member of any of the other leading families of Venice. Given her unusual name, it has been suggested that she was not even a Venetian. Whether or not this was the outcome Uncle Enrico favored is unclear. He had managed to keep a Polani kinswomen from the post, however. This was not something Doge Polani would forget. The feud between Uncle Enrico and Doge Polani reached its culmination in the events surrounding the Norman capture of the island of Corfu in 1147. Corfu was just south of Strait of Otranto, which connects the Adriatic Sea with the Ionian Sea. Just as they had back in 1081, the Normans were threatening to blockade the Adriatic Sea, thus cutting off Venice’s access to Constantinople and other trade centers in the eastern Mediterranean. They also plundered Byzantine cities on the western coastline of Greece, including Corinth and Thebes, and were threatening the rest of Greece. If they succeeded in dominating Greece the next target would be Constantinople itself. Just as they had back in 1081 the Byzantines turned to Venice for aid in expelling the Normans from their territories. In late 1147 Byzantine Emperor Manuel I Comnenus (1143–80) issued a chrysobull reaffirming all the rights Venice enjoyed in the Byzantine Empire as a result the chrysobull of 1082 and allowing the Venetians to expand their Quarter in Constantinople. In return, Doge Pietro Polani prepared a Venetian fleet and sent it to attack the Normans in the Spring of 1148. The Patriarch of Grado, Uncle Enrico, objected to this alliance between the Venetians and Byzantines. He pointed out that the Byzantines were Eastern Orthodox in religion and thus were, in his eyes at least, dangerous schismatics outside the fold of the true Catholic Church headquartered in Rome and led by the Pope. He denounced Doge Pietro Polani for coming to the aid of these enemies of the True Church and further asserted that he had the right to overrule secular leaders whose actions threatened the well-being of Christianity in general. Uncle Enrico was going out on a limb here. Most of the Dandolo family, along with many other prominent Venetians, were heavily involved in trade with the Byzantine Empire and had every reason to throw their support behind Doge Pietro Polani and Emperor Manuel I Comnenus in the struggle against the Normans. The Papacy itself had earlier declared war on the Normans for their activities on the Italian Peninsula, and it supported the Byzantines in part because Emperor Manuel I Comnenus had come to the aid of the Second Crusade, which the popes themselves had advocated. Also, the Patriarchate of Grado, which Uncle Enrico headed, had extensive property holdings in Constantinople and derived much of its income from the city. Thus Uncle Enrico stood opposed to the interests of his family, the interests of Doge Pietro Polani and the city-state of Venice, the policies of the Pope, and the financial well-being of the Patriarchate that he headed. Doge Pietro Polani, who had appointed his childhood friend to the office of Patriarch of Grado in the first place, was incensed by Uncle Enrico’s stance. He was still the secular leader of the city-state of Venice and using his considerable powers he now ordered that Uncle Enrico be sent into exile, effectively if not officially removing him from his post. He also exiled Uncle Enrico’s supporters among the clergy, several members of prominent families who had backed the Patriarch, and most if not all members of the Dandolo clan, even though there was little indication that they had actually backed the policies of Uncle Enrico. In a final blow, he ordered that all the Dandolos compounds around the Church of St.Luca be leveled to the ground. The Dandolos, once one of the most prominent families in Venice, had apparently come to an ignominious end. Uncle Enrico was down, but certainly not out. A practiced counter-puncher, he traveling to Rome where he presented his case to the recently elected Pope Eugenius III (r. 1145–53), who was clearly cut from different cloth than his immediate predecessors. Sided with Uncle Enrico, the Pope promptly excommunicated Doge Pietro Polani and put the entire city-state of Venice under interdict. The Doge, who had more important matters on his mind, was not particularly impressed by the Pope’ actions. He himself took command of the fleet that set sail for Corfu in the summer of 1148. He died of indeterminate causes not long afterwards. The fleet, now under the command of his brother and son, joined with the Byzantines and besieged Corfu. After a year the Normans were finally ejected from the island. In return for their aid, Emperor Manuel Comnenus granted the Venetians still more trading privileges in the Byzantine Empire. With Doge Pietro Polani dead and gone the feud between his family and the Dandolos began to cool down. The new doge, Domenico Morosini (1148–55), rescinded the exile of clergy who had supported Uncle Enrico, but the Dandolos were not yet able to return to Venice. Some apparently gathered around Uncle Enrico in Rome while others took up residence in Constantinople. In late 1149 discussions finally began between the Pope, Uncle Enrico, and the new doge, Domenico Morosini. The doge immediately conceded to one of Uncle Enrico’s main concerns and agreed that henceforth he and other lay powers in Venice would not attempt to exert any influence on ecclesiastical matters in Venice nor would they interfere with elections to religious posts. Uncle’s Enrico’s objections to the role of the doge in the election of the Abbess of St. Zaccaria was, it will be remembered, one of the factors that had ignited the whole controversy to begin with. Now Doge Morosini actually agreed that he and subsequent doges would take an oath vowing to stay out of church affairs altogether. Surprisingly enough, even though Uncle Enrico had brought his own family to the very brink of total ruin in the process, he had in the end achieved one of his most cherished goals. There was a concomitant price to pay, however. Just as lay officials no longer had any power over ecclesiastical matters church prelates henceforth could not take part in the business of government. This was to have consequences in the run-up to the Fourth Crusade, when some churchmen might well have had objections to the actions of some of the key players. Ironically enough, it was Uncle Enrico who set the stage for his nephew Enrico Dandolo to play his part as the undisputed leader of the Venetian continence and arguably the mastermind behind the Fourth Crusade and the sack of Constantinople. No religious figure, not even the Pope himself, would have any real influence on him. 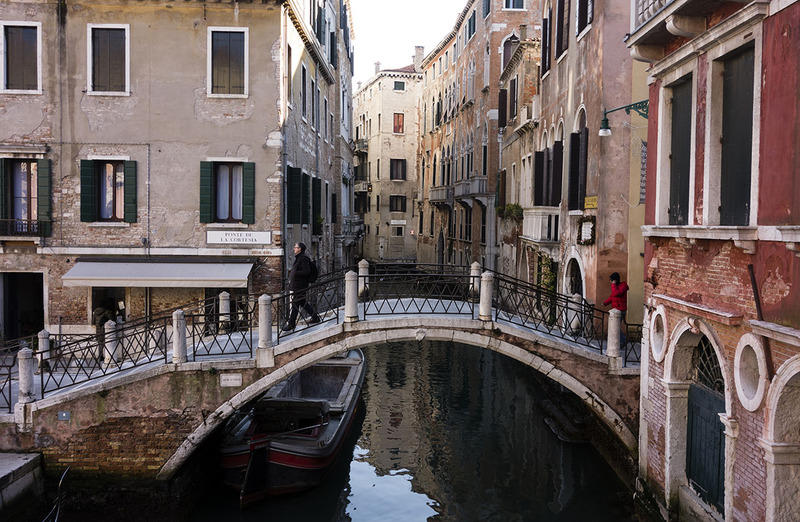 The Dandolos remained in exile, however and city of Venice remained under interdict until the fate of the Dandolo family could be decided. The Polani-Dandolo feud was still smoldering and threatened to flare up again if the Dandolos returned to Venice. Hoping to reconcile the two families, Doge Morosini resorted to the time-honored practice of uniting them in marriage; he proposed a union between Andrea Dandolo, the nephew of Uncle Enrico and brother of future doge Enrico Dandolo, and Primera Polani, the niece of now-deceased Doge Pietro Polani. 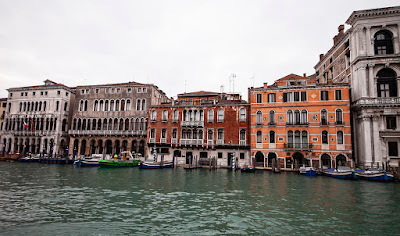 Once the marriage proposal was accepted Doge Morosini agreed that the Dandolos could return to Venice and that the state would pay to rebuilt their houses, which had been destroyed by order of Doge Polani. These concessions having been made, Pope Eugenius II lifted the interdict against Venice, and in the 1151 or 1152 the Dandolos returned to Venice and set about rebuilding their compounds around the Church of St. Luca. Uncle Enrico had prevailed and the Dandolos were back in town. 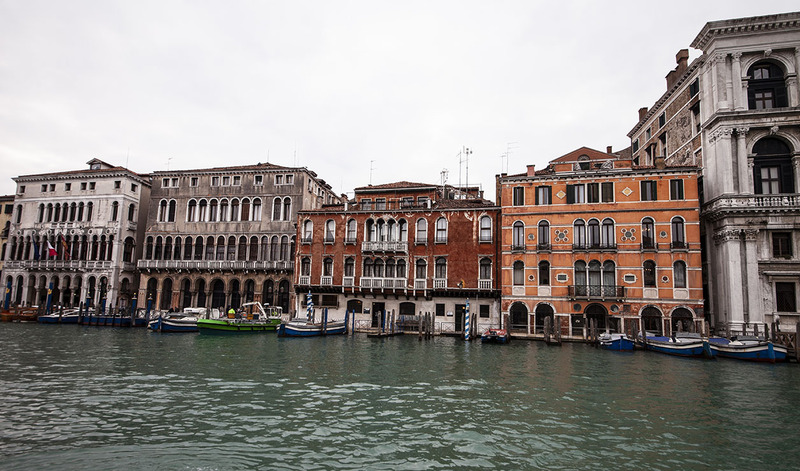 He scored a further triumph in 1156 when he built a patriarchal palace at St. Silvestro, directly across the Grand Canal from the family compounds around St. Luca. Hitherto the Patriarchate of Grado had been officially headquartered in Grado, fifty miles to the east of the Venetian Lagoon. Now Uncle Enrico had effectively moved the Patriarchate to Venice. Giovanni Polani, the kinsman of Doge Pietro Polani, was still the Bishop of Castello and nominally the head of the Church in Venice, but the Church law against one prelate residing full-time within the jurisdiction of another was simply ignored. The Bishop of Castello was now overshadowed by Uncle Enrico, the Patriarch of Grado, ensconced just a few hundred feet from commercial heart of the city, not far from the future site of the Rialto Bridge. Giovanni Polani could not have been happy about this development but there was not much he could do about it. Assuming that Enrico Dandolo, the future Doge, was born in 1107, he would have been forty-four or forty-five when the Dandolos returned from exile and began rebuilding their family compounds in the parish of St. Luca. As we have seen, Domenico Dandolo, the grandfather of Enrico Dandolo, had four sons: Bono, Pietro, Enrico (Uncle Enrico, the Patriarch of Grado) and Vitale, Enrico’s father. Bono, who had managed the family business on Constantinople, had died relatively young, apparently sometime in the 1130s, and had no children. Uncle Enrico, as a churchman, was not entitled to any of his father’s property. Thus Pietro and Vitale had inherited the family compounds when Domenico Dandolo died, also sometime the 1130s. After the family returned to the city Pietro built a new compound fronting on the canal known as the Rio di San Luca and just to the north of the Church of St. Luca. Rio di San Luca. Pietro Dandolo’s compound would have occupied the site of the buildings on the left. Between the rear of the church and the compound was a small square, now known as Campiello de la Chiesa (often identified, incorrectly, in guidebooks and even scholarly literature as the Campiello di San Luca). Vitale, Enrico’s father built his family compound on lots to the north of the Church of St. Luca, fronting on the Grand Canal. It was here that Enrico, the future doge grew up and presumably spent most of his life before being elected as the forty-first doge of Venice in 1192, at the age of eighty-five. Church of St. Luca from across the Rio di San Luca. 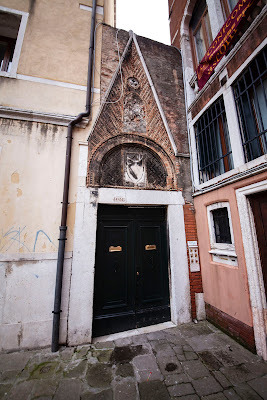 This is the latest reiteration, but it stands on the same place as the parish church founded by the Dandolo family. This Gothic arch was reportedly part of Pietro Dandolo’s compound; it was eventually incorporated into later buildings. 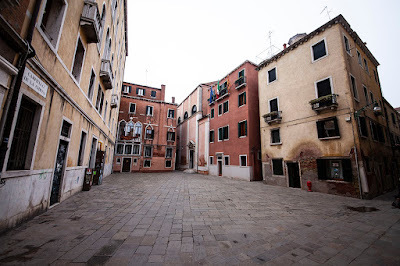 The three palazzos in the middle now occupy the site of Vitale Dandolo’s compound. Vitale soon became the acknowledged leader of the clan. Within a year or two after returning from exile he was appointed as a judge, instantly catapulting him back into the highest levels of Venetian society. He was also named as the advocate of St. Zaccaria Convent, making him in effect the order’s legal council. This position did not, however, actually require legal training. One only had only to be an outstanding and well-respected member of the community. That Vitale was chosen as advocate of St. Zaccaria, one of the wealthiest and most prestigious convents in Venice, was just another indication of just how quickly the Dandolos had recovered from their apparent downfall at the hands of Doge Polani. 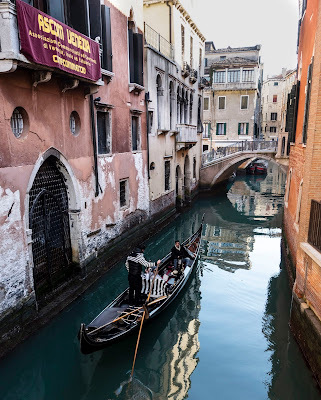 His brother, Uncle Enrico, now the most powerful religious figure in the city, no doubt helped Vitale climb the rungs of Venetian society, but it is clear that Vitale was a formidable figure on his own. Vitale had been born c. 1187. By 1164, when he was in his late 70s, he apparently retired from active pubic life. 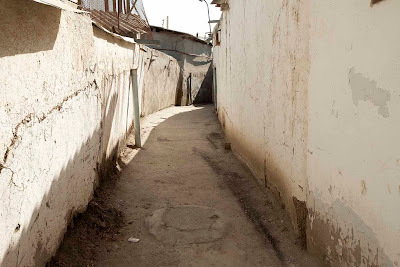 Yet such was his standing in the community that he was often called upon to mediate disputes. He also retained his position as advocate of St. Zaccaria Convent and served as an unofficial counselor to the Doge. Eventually, however, he began to cede control of family affairs to his sons, Andrea, Giovanni, and Enrico (daughters, if he had any, are absent from the historical record). Andrea, who married the niece of Doge Polani, thus burying the hatchet in the Polani-Dandolo feud, apparently managed the family’s business affairs in Venice, although little else is known about his life. Giovanni apparently took over the role of his uncle Bono, overseeing the family’s interests in Constantinople, Acre, and other foreign ports. As we have seen, what Enrico was doing at this time remains somewhat of a mystery. His first significant entry into the historical record occurs in 1172, when he was sixty-five years old.